Nerissa and Katryna Nields are the sisters and singers from the folkband the Nields. In the summer of 1998, Nerissa and Katryna were asked to play Lilith Fair, but leave the boys at home. The performance was a success, and the sisters decided to do some shows on their own. 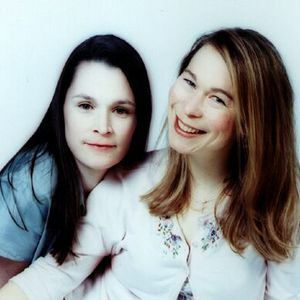 This duo configuration, which Dar Williams jokingly dubbed "the Probe effect" (a term familiar to followers of Star Trek) allowed Nerissa and Katryna to travel to places in the country (especially the West Coast) that the full band hadn't been able to get to as often as their usual haunts in the East. Within a year, the duo was opening for Cry Cry Cry, doing a tour of Alaska, playing the Newport Folk Festival and becoming a bona fide act of its own. Katryna joined Nerissa in the studio in the fall of 2001 to record their first record as a duo. Love and China was produced and engineered by Dave Chalfant (husband of Katryna and member of the Nields). Love and China was released in the spring of 2002 on Zo?, and Nerissa and Katryna spent much of the next year on the road touring in support of it. Also in 2002, Nerissa was approached by Scholastic to write a young adult novel, Plastic Angel, based on the song "This Town Is Wrong" (from If You Lived Here, You'd Be Home Now). She had already been at work on a semi-autobiographical novel about a touring band, and jumped at this chance. Since the protagonist of Plastic Angel is a songwriter, it naturally follows that a CD should accompany the book. Nerissa and Katryna recorded the companion CD in the fall of 2003 (with Dave Chalfant once again producing), and This Town Is Wrong was released in 2004. The book was published in the spring of 2005. 2007 has seen the release of two separate CDs. The first is All Together Singing In The Kitchen, a collection of songs for all ages. The latest release is Sister Holler. Their fourteenth album to date brings them back to their folk roots while at the same time showcasing their growth as musicians and songwriters. The premise of the album is that Folk music has always been passed down orally, and as such, it changes with each generation of singers and songwriters. Each song was inspired by a pre-existing song: there's a revised version of the old spiritual, "Ain't That Good News," a modern sea chanty ? even a version of Pachelbel's Canon in D.
Bio mostly taken from their official website: www.nields.com.